Tag Archives for " Doug Hubbard "
Real time search data is turning up some very interesting trends and business opportunities for those that know how to measure and analyze the data. 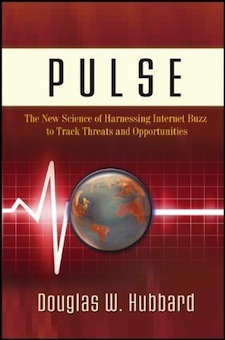 I turned to Doug Hubbard, author of Pulse: The New Science of Harnessing Internet Buzz to Track Threats and Opportunities to talk about this very idea. Hubbard is the inventor of the powerful Applied Information Economics (AIE) method. He is also the author of How to Measure Anything: Finding the Value of Intangibles in Business. Hubbard shared a basic example of how Google Trends data could accurately predict unemployment rates in real time based on search trends – something that took the Department of Labor months to do. Pulse has a complementary website (www.pulsethenewscience.com) with links, analysis, examples, and spreadsheets. A Canadian epidemiologist tracking “flu symptoms” searches on Google is able to track flu outbreaks faster than Canadian health authorities. His success inspired Google’s “Flu Trends” tool. Tracking Twitter comments about upcoming movies could reliably predict box office success better than any other method. The number of “unemployment” Google searches nationwide tracks very closely to Bureau of Labor Statistics unemployment reports, which releases its data monthly after sampling 60,000 households while Google trends data is available weekly—and for free. Tracking Twitter comments produces nearly the same results for consumer confidence and political polls as Gallup polls—except that Twitter results are real time and free. For more trend resources check out My Trend Radar Points Here.